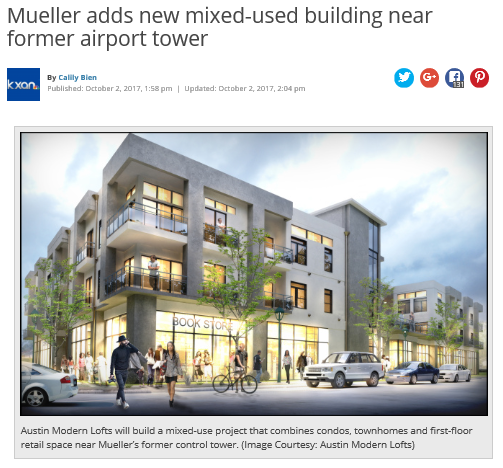 AUSTIN (KXAN) — The empty lot that currently sits across from the former Mueller airport control tower will be turned into a mixed-use development. 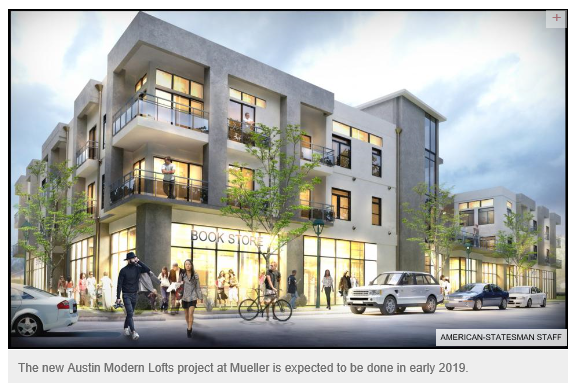 On Monday, Catellus Development Corp. announced it selected Austin Modern Lofts to build Mueller’s next edition, which will start construction in early 2018. The new residential and retail development at the northwest corner of Berkamn Drive and Tom Miller Street will have 91 for-sale residential units comprised of 35 condos and 56 townhomes. According to a press release, 29 of the for-sale units will be a part of Mueller’s affordable homes program that sets aside units for low-income households. Pricing information will be available once the project is fully designed. The building will also have 6,000 square feet of retail space. Within the project, there will roof and patio terraces as well as open spaces. Mueller expects the first move-ins to happen in early 2019. 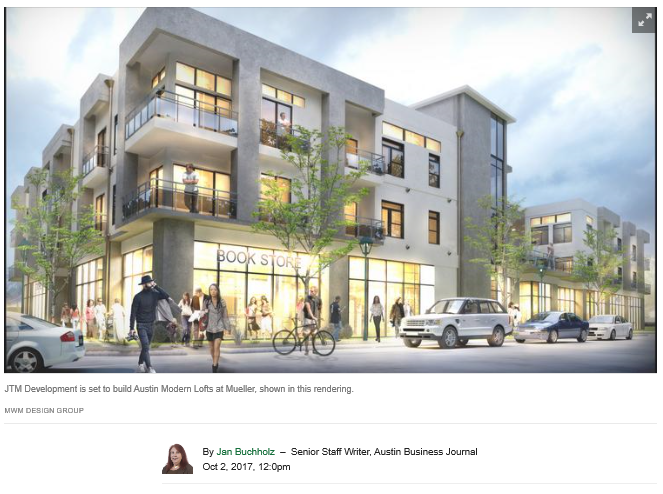 The entire Mueller development covers 700 acres in east Austin. Upon completion of all the lots, the development will feature nearly 6,000 single-family and multi-family homes. Mueller, the massive redeveloped master-planned community on the former Robert Mueller Municipal Airport, is adding another housing element to its mix. Austin Modern Lofts, a for-sale residential condo project that includes high-rise and townhome-style units, will be built on the northwest corner of Berkman Drive and Tom Miller Street. The 3-acre site is across the street from the former airport control tower — an historic landmark of a bygone era. Prices for the condos and townhomes haven’t been set yet, pending final design of the project, according to Catellus Development Corp. About a third of the residences – 29 – will be set aside as part of Mueller’s income-based affordable housing programs. Catellus is the master developer overseeing the transformation of the 700-acre site, which was previously home to the city’s now-closed Robert Mueller Municipal Airport. The tower was among just three structures — along with a 1940s-era wooden hangar and the private terminal that was converted into the Mueller Central visitors center and office building — left standing when the old airport was demolished after its closure in 1999. 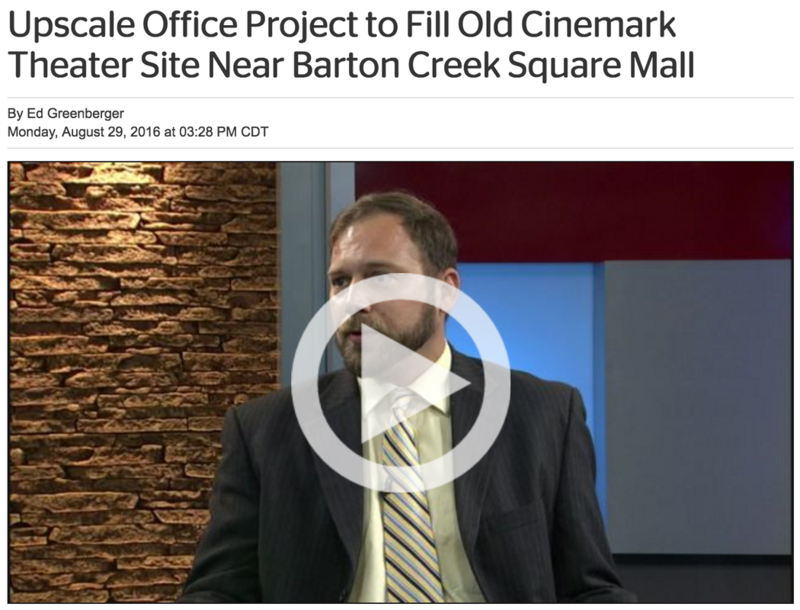 AUSTIN - A new office project is scheduled to break ground west of Barton Creek Square mall, on the former site of a Cinemark theater. JTM Development is building Walsh Tarlton Overlook at 2530 Walsh Tarlton Ln. 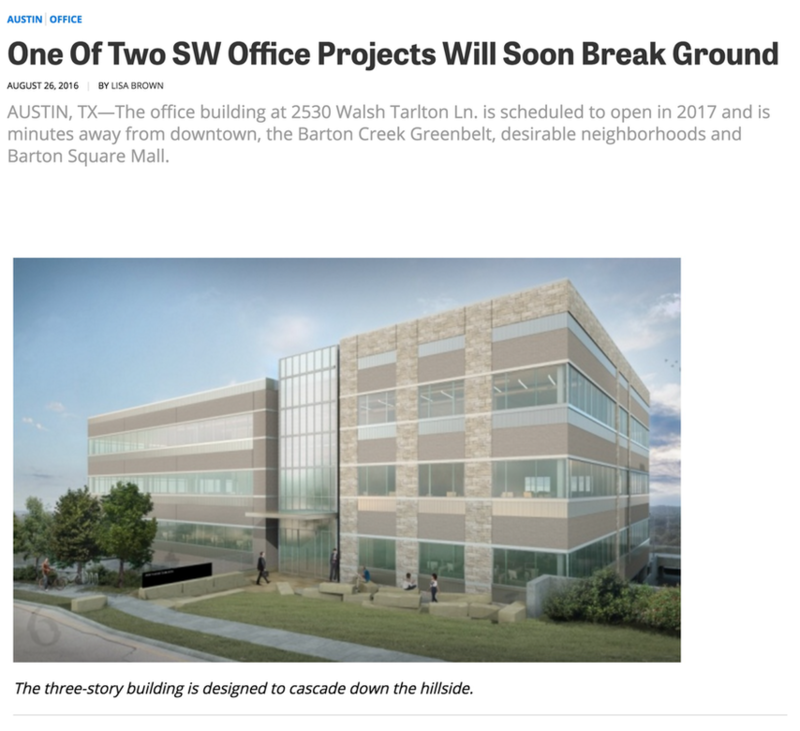 Walsh Tarlton Overlook, designed by Austin-based Sixthriver Architects, will yield 55,000 sf of Class A office space in a desirable area where vacancies have been scarce. The Texas Department of Licensing and Regulation indicates that the project is valued at $9.5 million. Elevators from the five-level underground parking garage will deliver employees directly to their offices. See earlier story Austin townhomes, office to Walsh Tarlton Lane near Barton Creek Mall. 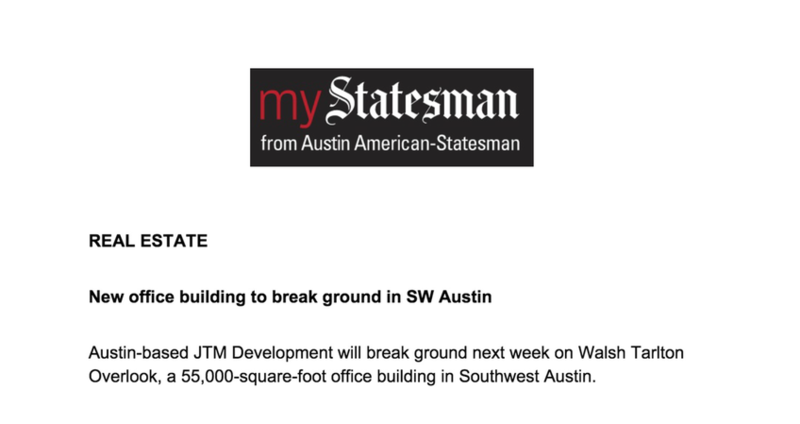 Austin-based JTM Development along with partner Cypress Real Estate Advisors plans to break ground this week on a 55,000-square-foot, Class-A office building in Southwest Austin, located near Loop 360 and the Barton Creek Square mall. 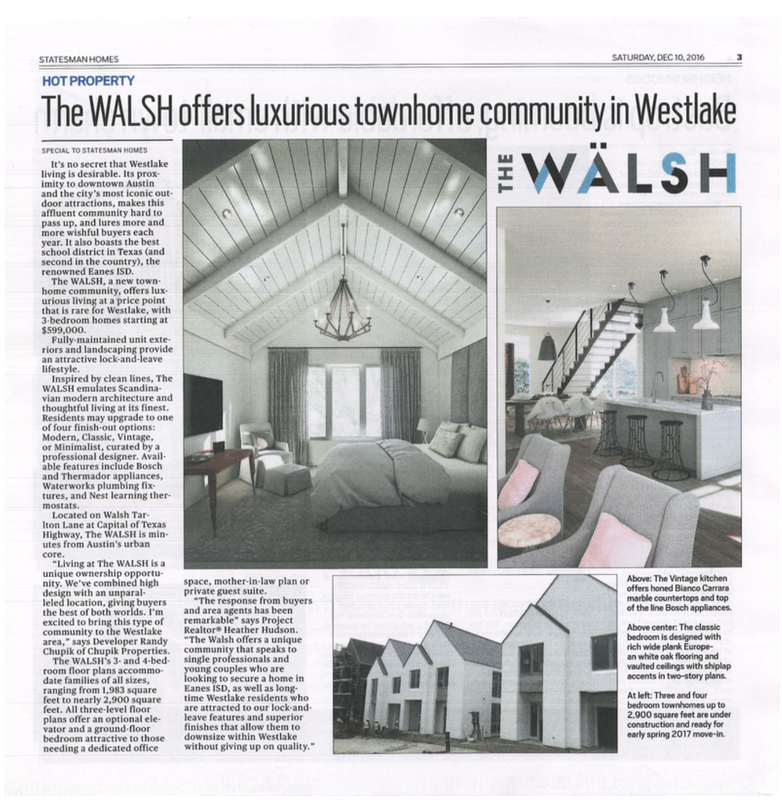 Walsh Tarlton Overlook, to be built at 2530 Walsh Tarlton Lane, will be a three-story building designed to tier down a hill, offering outdoor views from every floor. The building will feature limestone, marble and walnut finishes, and elevators connecting the office floors to the five-floor parking garage beneath the building. Sixthriver Architects designed the project, and The Burt Group is the general contractor. JTM Development previously developed the Rob Roy Office Park in Southwest Austin. Take a look at the Walsh Tarlton Overlook video feature covered by TWC News! 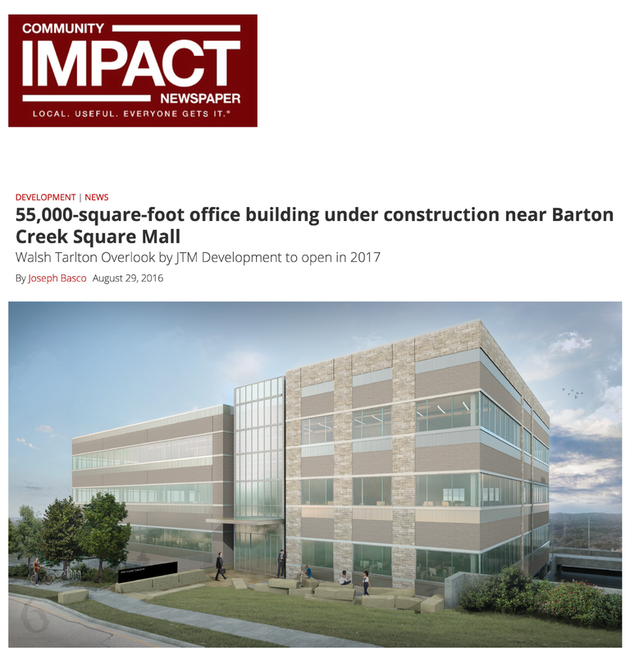 ​AUSTIN, TX-In what is being called one of the best locations in Austin, Walsh Tarlton Overlook, a 55,000- square-foot office building at 2530 Walsh Tarlton Ln., is soon to get underway. The building is scheduled to open in 2017 and is one of only two office projects currently under construction in Southwest Austin . 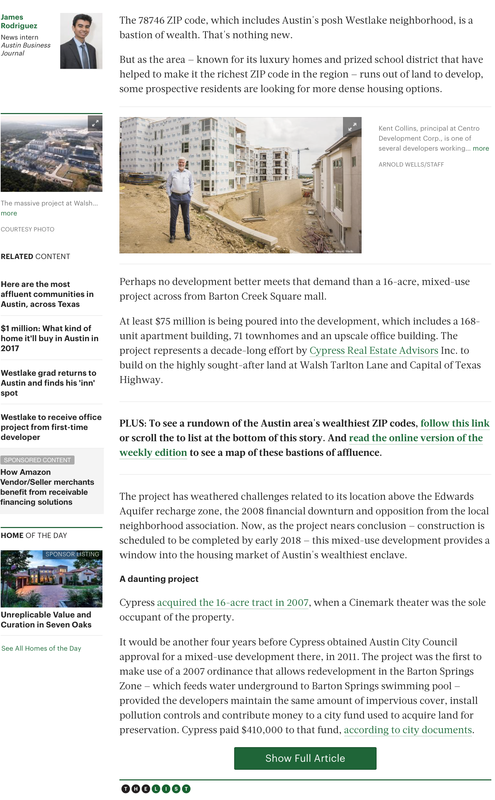 "This is absolutely one of the best locations in Austin," said JTM Development founder Tom Mercer. "It's just minutes away from downtown, the Barton Creek Greenbelt and several of the city's most desirable neighborhoods, not to mention directly across the street from one the biggest and most popular shopping destinations in Austin."